Setting up Drupal with Cherokee is really easy. This recipe describes the Drupal 6.x installation, which is the latest release at the time of writing. Of course you can always access Drupal and have it automatically downloaded and deployed through the Market section, but should you decide to install it manually here are the steps to follow. You will need PHP support correctly configured in Cherokee, and PHP with the MySQL module installed. The default configuration already provides a valid PHP configuration for Cherokee if you have php-cgi installed, but you can follow the appropriate recipe about setting up PHP in case you don’t have it available for some reason. Provided the above conditions are met, you could start Drupal’s installation and you would already be able to have your site up and running. Set up an appropriate url rewriting configuration for Drupal. Serve directly the static content to avoid the dynamic-processing bottle-neck. 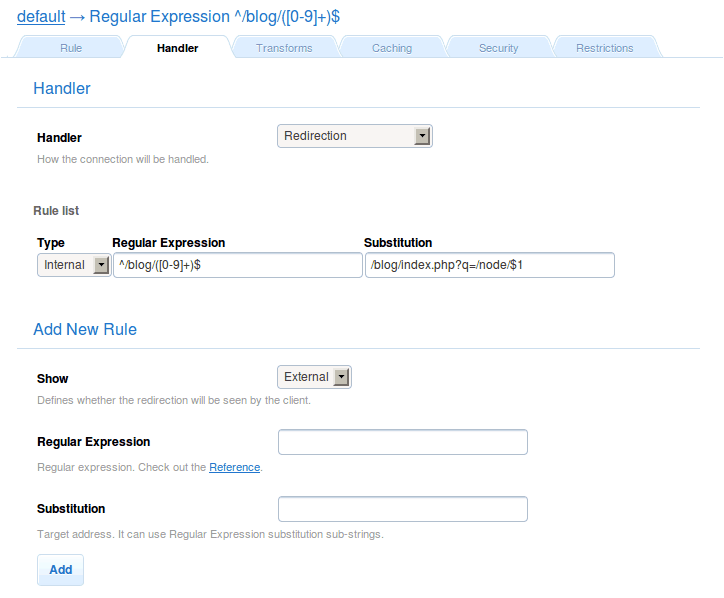 Use the regex from Drupal’s .htaccess for denying access to certain paths. With this we should be able to do everything Drupal’s supposed to do, and it should work with Imagecache’s dynamic thumbnail generation. There are two ways of installing Drupal: it can either be installed as a new virtual server or be installed inside a directory of some of the virtual servers that already exist. We’ll begin by covering the first scenario, and will then make a trivial adaptation to cover the second case. We’ll begin by cloning the default virtual server, just to keep the default PHP configuration. Create a clone named example.net. This clears the first milestone. The remaining three will be accomplished by tweaking the example.net virtual server. Remember to set up the Document root to /var/www/drupal. Delete all the rules except php and Default. 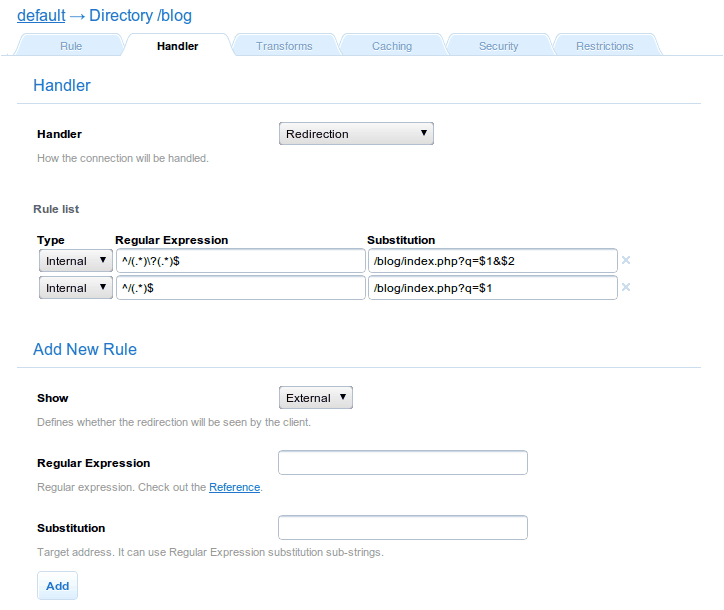 As previously, we will manage the Default rule with the redirection handler. 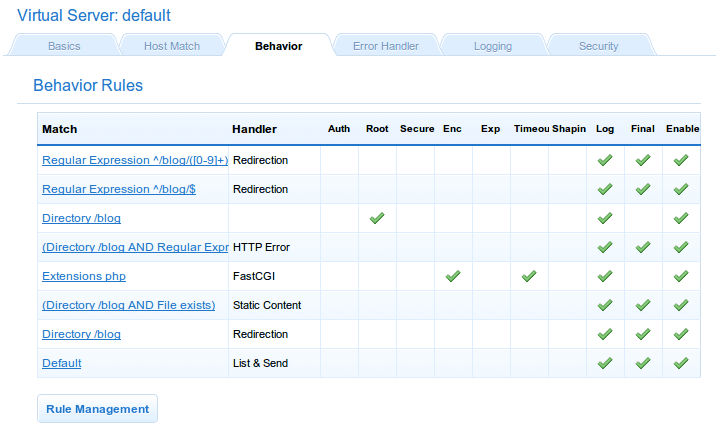 Remember to set up Drupal as custom error handler for the virtual server. 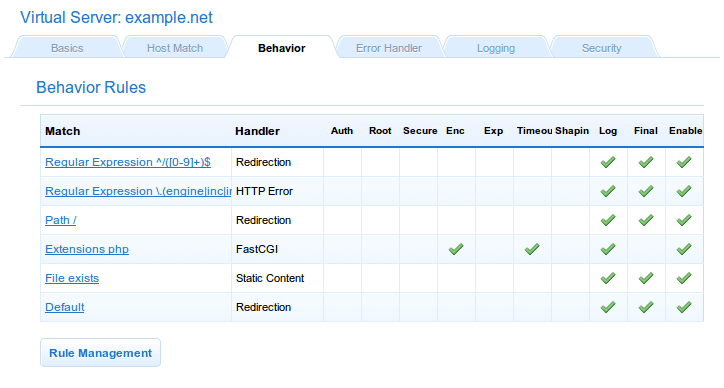 Do so in the Error Handler tab, selecting the Custom redirections option and sending 404 errors to Drupal. Next, we need to address the clean URLs matter. To do so, create another redirection rule. After this we will go straight to another milestone: directly serving static files, which is an easy task to accomplish. Just set up a File Exists-type rule. 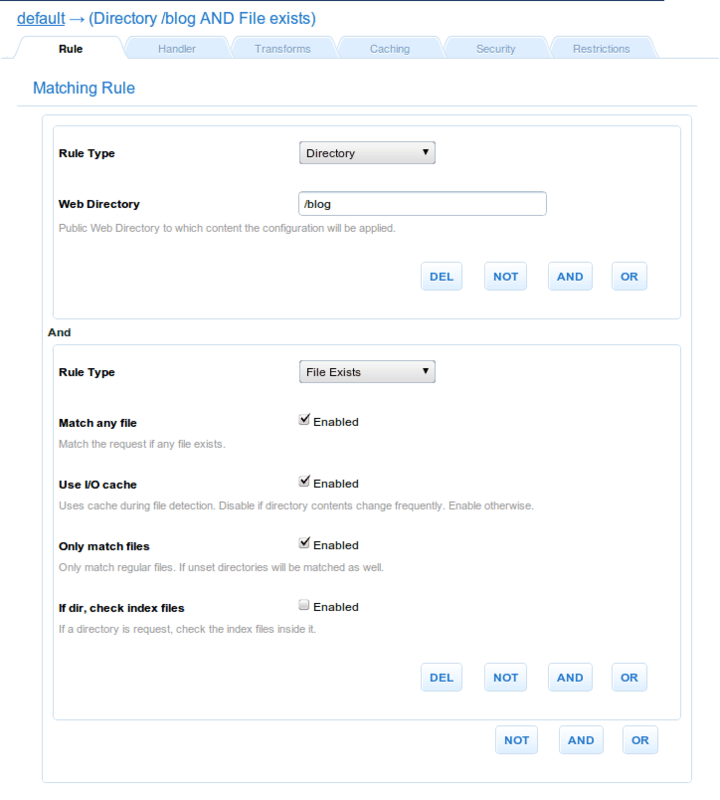 Check the Match any checkbox, and manage it with the Static file handler. Remember to activate the IO Cache option and to specify whatever expiration period you see fit for these files. If you ever edit the configuration just remember that this rule should be located after the PHP rule. Otherwise you will end up statically serving them instead of processing them via PHP. In fact it is a good idea to keep your rules for dynamic contents in a high position on your list of rules. All done. After this you should have six rules in your list. This configuration does work. Reorder your rules accordingly if you seem to have any trouble. You will also have to define a set of 6 rules, although in this case it will be a bit different. We will be using the default virtual server, a web directory /blog and we will assume we are going to install Drupal under /var/www/drupal on our directory tree. Send static files as such. For this you will define a complex rule using both a Directory (set to /blog), and a File Exist types. Remember to enable caching, as in the screenshot. 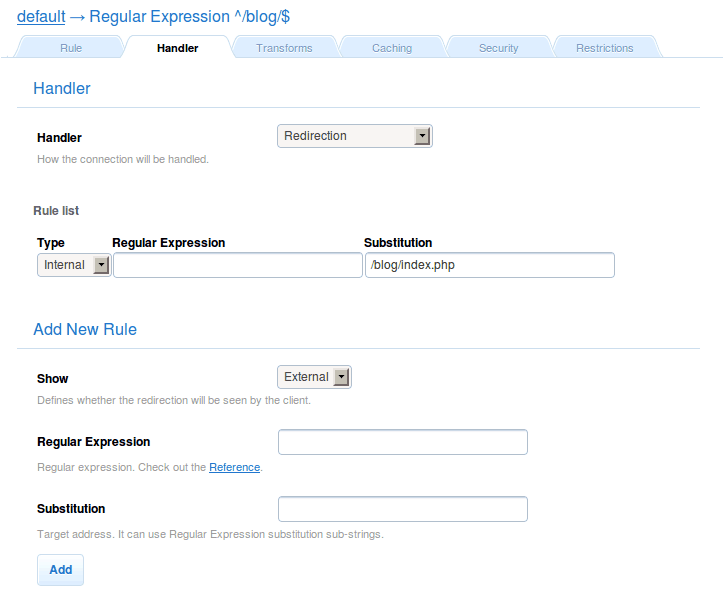 The last rule related to Drupal’s configuration should be a catch-all internal redirection for a couple of regular expressions. At the end of the process you should end up with a list of 8 rules. Rearrange from top to bottom according to the order given in the steps if you seem something is wrong with your setup. The last one and any subsequent rules will belong to the previously defined virtual server. As before, once you are done configuring Cherokee you can proceed to set up Drupal. First download and uncompress the distributed Drupal release into /var/www/drupal, and create a database suitable for the installation. And create the database for Drupal. 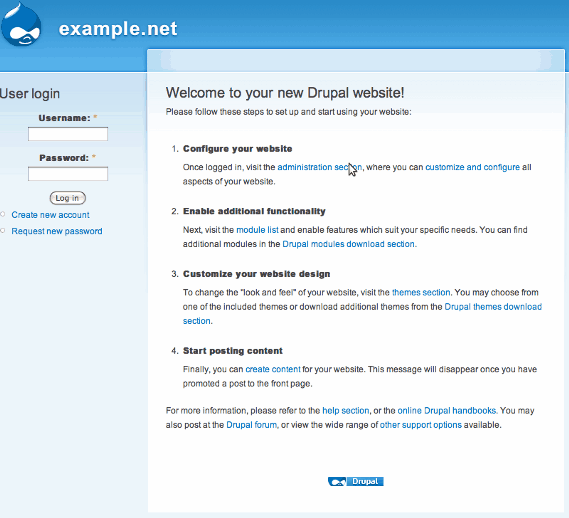 We will be using the name drupal, the user drupaluser and the password drupalpassword, but you should set up your own. Then point your web browser to http://localhost and follow the instructions provided by the installer. And the installation will be almost automatic. Just fill up the requested values and you will obtain the following results once your are through. As of Drupal 6.14, a problem has been reported related to gzip compression of multilingual contents. You are advised to disable gzip compression for the rule that manages PHP in your Drupal Virtual Server. If you are not using a multilingual Drupal or find another workaround for the issue, you will probably want to enable gzip encoding on the PHP rule to increase performance.